desirable homes for families and children. public housing. Wood envisioned racially integrated public housing, scattered throughout the city. She argued that thoughtfully planned public housing could help to solve urban problems such as slums, crime, and poverty. During this time, Wood lived here at 3145 North Cambridge Avenue. 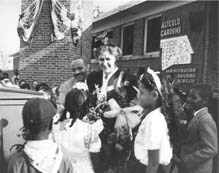 During her tenure with the CHA, Wood oversaw the construction of residences for more than 60,000 people, including many who lived in the Cabrini-Green Homes, the Ida B. Wells Homes, and the Julia C. Lathrop Homes. But Wood also constantly found herself battling aldermen who did not want public housing built in their neighborhoods. Her refusal to compromise on issues of patronage was considered arrogant by many involved in Chicago's entrenched political machine. Wood's attempt to integrate the Trumbull Park Homes in 1953 contributed to prolonged racial violence, and led to her departure from the CHA.